The new Yamaha YHR671 French Horn features a variety of exciting design changes for the advancing student or professional horn player while retaining Yamaha value, quality and consistency. Through the Yamaha ideology of vertical integration, this professional model offers many of the same high end updates and innovations as the new Custom YHR-871D. It also comes with a protective case. The Bb 2nd valve slide features a new long pull ring making it much more convenient for the player. 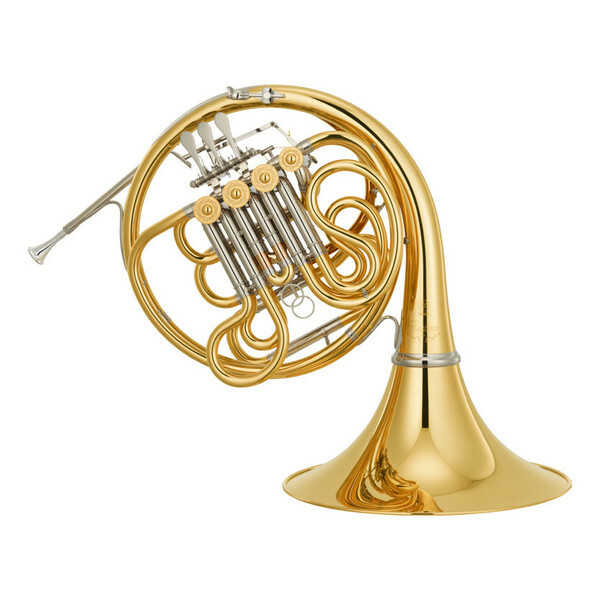 A new gold-brass leadpipe design contributes to create a beautiful rich tone and consistent airflow that will provide greater sound character. Both the main tuning slide and F tuning slide now have rounded shapes. This new design gives the instrument a smooth playing feel. The adjustable 4th thumb lever can be adjusted for the most comfortable playing position. The nickel-plated brass rotary caps help sustain durability in this professional model and provide the time-tested quality Yamaha is known for. In combination with the new goldbrass leadpipe design, the thicker rim wire creates a beautiful rich tone and consistent airflow and encourages the best performance in any player.